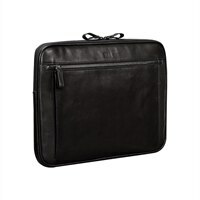 Carry your laptop in style with the genuine leather zip around sleeve. Designed to carry a devices up to 14 in., this leather sleeve made for the modern lifestyle is also compatible with tablets. New for 2018: our Deen Collection features a new, full grain genuine leather.